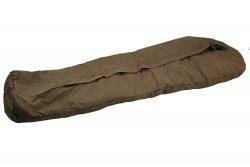 Defence 6 this high-performace winter sleeping bag is designed for uncompromising warmth retention in arctic conditions. It has a triple-layer sandwich construction with a loose-fitting shellproof shell which guarantees optimum warmth. It has a generous draft tube on the inside of the zipper to prevent any heat loss at the zipper. Additionally it has a protection flap on the outside to keep out wind and wetness.